Board Members of the Combustion Institute are once again being elected ahead of the next Symposium. The British Section has two strong candidates standing for election and it is important that we have representation on the Board. If you voted in the 2014 election or are already registered then no further action is needed. E.ON is looking for a Senior Gas Turbine Combustion/Emissions Engineer to be based at the Ratcliffe Technology Centre, Nottingham, UK. This vacancy is open until 17 January 2016. The Spring Meeting of The Combustion Institute (British Section) will take place in the Department of Chemical and Biological Engineering at the University of Sheffield. The one-day meeting will review the challenges in low carbon combustion technologies. Poster Session. A poster session will be held during the meeting, and a prize will be awarded to the best contribution. Please email the title of the poster to y.wu@sheffield.ac.uk by 20th May 2015. Directions to the meeting. The meeting is held in the Department of Chemical and Biological Engineering, Sir Hadfield Building, Sheffield University, Sheffield S1 3JD. The registration desk and poster session are in the Idea Space in the Sir Hadfield Building. The lectures are held in the lecture theatre HB-LT22 in the Sir Hadfield Building. See map of the venue. Public Transport. Sheffield is well connected by rail service. It is a short distance (about 15 minutes’ walk) from the railway station to the Department. There is tram service (the blue line) connecting the rail station and the University. West Street is the best stop for the Department if you use the tram. Accommodation. Rooms are available in the university Halifax Hall at rate of £65 for single use. Please contact Yajue Wu, y.wu@sheffield.ac.uk, if you need accommodation. A dinner is organized at the Halifax Hall (£30/person). Please contact Yajue Wu, y.wu@sheffield.ac.uk, if you would like to attend the dinner. The programme and other details can be seen in the flyer for download here. Editor-in-Chief Vacancy – inviting applications now! We are pleased to present an exciting opportunity, namely an Editor-in-Chiefship of one of the leading journals in Energy: the highly prestigious review journal Progress in Energy and Combustion Science, affiliated with the Combustion Institute and having a 2013 Impact Factor (© Thomson Reuters’ Journal Citation Reports) of 16.909. This role offers you the opportunity to lead, shape and innovate peer-reviewed scientific communication in your field. The key tasks of the Editor-in-Chief are: acquiring and selecting the best review articles that fall within the scope of the journal, acting as the ambassador for the journal, and fostering collaboration and teamwork with your Editorial Board, the publishing team of the journal based at Elsevier, the Combustion Institute, and the broader Journal community. The appointment available is for an initial 3 year term, which may be extended by mutual agreement. In addition to remuneration, the successful candidate will receive: Ambassador Access to ScienceDirect and Scopus, membership of COPE (Committee on Publication Ethics), an iThenticate CrossCheck account, relevant market data, plus the expertise and support of our publishing house. You are well-established as an expert in the fields covered by Progress in Energy and Combustion Science whilst remaining an active scientist. Furthermore, you have a good understanding of related and interdisciplinary areas, a feel for how your field is developing and a view of the emerging scientific topics. You are a people-oriented networker, with international contacts, and the ability to attract key scientists as top authors, reviewers, guest editors or editorial board members, and to foster collaborative and productive relationships with them. You understand the importance of managing the peer review process in a scientifically sound, efficient and ethical way. You are a strategic thinker and together with the Publisher, you would be comfortable developing ideas about future directions for the journal, remaining open to feedback from authors and readers. You have an interest in the future of learned journals, and scientific communication in general and an affinity with the internet. You may have some experience with social media. If this sounds like you, and you wish to reply or request further information, please contact Katherine Eve, Executive Publisher, Progress in Energy and Combustion Science, care of email: k.eve@elsevier.com. Applications are now invited – deadline for applications is 31 March 2015. Please include your CV and a letter outlining your suitability for the role. The 31st of December is the deadline for nominations for the 2014 Hinshelwood Prize. It recognizes good work done by younger members of the section in any aspect of Combustion. The rules for the award are detailed here. Nominations and required documentation should be sent to the Secretary (y.hardalupas at imperial.ac.uk) by the deadline. We are delighted to report that the Hinshelwood and Sugden prizes for 2013 were given during the recent AGM meeting of the British Section in London. The Sugden Prize 2013 for the best paper by a member of the British Section has been awarded to a paper co-authored by Chrystie R.S.M., Burns I.S. and Kaminski C.F. "Temperature response of an acoustically-forced turbulent lean premixed flame: A quantitative experimental determination", published in Combustion Science and Technology 185, pp 180-199, 2013. The committee was chaired by Guillermo Rein with assistance from Nontas Mastorakos and Yajue Wu. The Hinshelwood Prize 2013, in recognition of meritorious work by a younger member of the British Section, has been awarded to Dr Edward S. Richardson, Associate Professor at the University of Southampton, for outstanding work in computational analysis of two-phase reacting flows. The committee was chaired by Stewart Cant with assistance from Bill Jones and Neal Morgan. 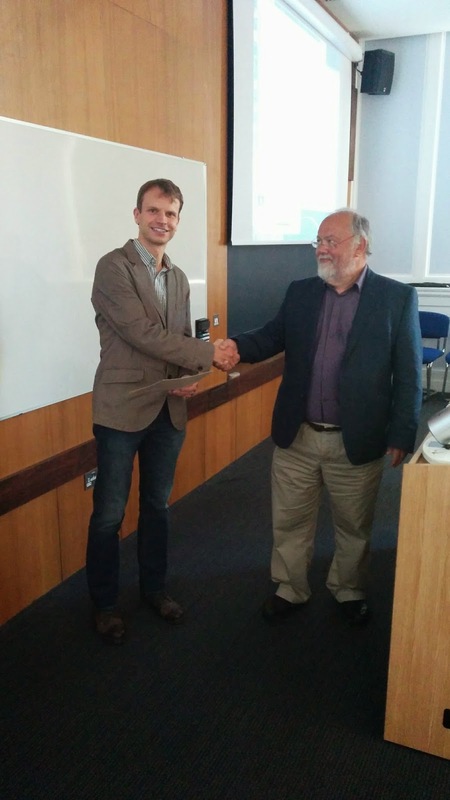 Dr Burns was given the 2013 Sugden Prize by th chairman Prof Jones. The AGM will be held held at Imperial College on the 24th of September at Imperial College London. The aim of the meeting is to provide an overview of the current research activities in the UK combustion community. Scientists and engineers are invited to submit contributions on all aspects of combustion science and technology from fundamental physical and chemical processes to applications. The meeting will consist of a combination of 8-minute oral presentations, and subsequent poster presentations, based on accepted abstracts. Turbulent Combustion. Including experiments, theory and simulations of turbulent flames, as well as fundamental aspects of combustion dynamics. Explosions and Fires. Including detonations, explosions and deflagration to detonation transition. Also including fundamental aspects of fires, fire spread and buoyant flames. The use of hydrogen rich mixtures as well as syngas and bio-derived fuel blends. Combustion Diagnostics. Including the development and applications of diagnostic techniques and sensors for the understanding and control of combustion phenomena. Multiphase Systems. Including experiments, theory, and simulations applied to droplets and spray combustion. Also including fundamental aspects of combustion of solid fuels (e.g. coal and biomass), the formation of particulates and material synthesis. Propulsion, Power Systems and Emissions. Including modelling, simulation and experiments on phenomenological aspects of propulsion (engines and gas turbines) and power systems. Including CO2 capture, chemical looping and emissions. The meeting will be help at Imperial College London, in the Royal School of Mines Building, entrance through Prince Consort Road, SW7 2BP. The registration desk and posters will be in Room G38 and Oral Presentations in the Lecture Theatre G20. Both of them are on the ground floor and will be clearly indicated. Visitors are recommended to use public transport. For more information visit http://www3.imperial.ac.uk/campusinfo/southkensington Note that Parking spaces are very limited, and only available to those with a specific need (requests should be sent to s.navarro@imperial.ac.uk). 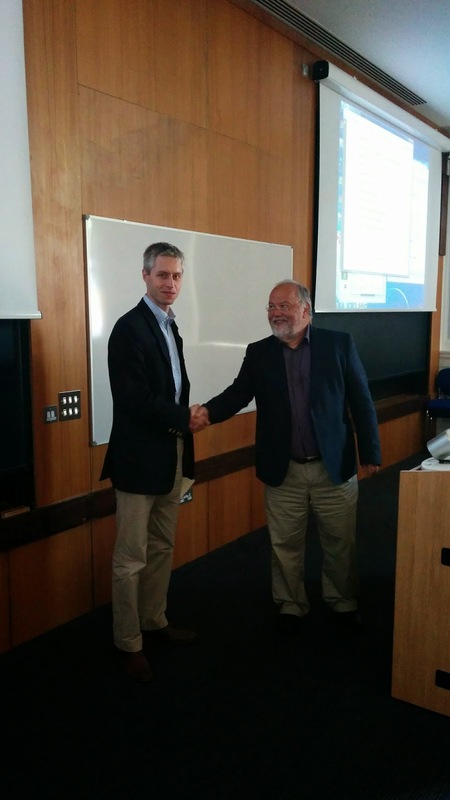 Organisers: Prof Peter Lindstedt and Dr Salvador Navarro-Martinez (s.navarro@imperial.ac.uk). The Department of Mechanical Engineering at Imperial College London invites applications for a Lecturer/Senior Lecturer post in the area of Thermofluids. Candidates should preferably have expertise in the development of advanced laser diagnostic techniques and their application to complex single or multi-phase turbulent flows with or without reaction, such as those occurring in IC engines or gas turbines. However, outstanding candidates in other areas of experimental fluid mechanics will also be considered. The successful candidate will join the Thermofluids Division in the Department of Mechanical Engineering with a view to eventually leading research in their areas of expertise. The person appointed will be expected to contribute to the teaching of mechanical engineering at undergraduate and postgraduate levels. The appointees will be expected to plan and direct the implementation of research activities and programmes of outstanding quality, international repute and innovation in Thermofluids. Informal e-mail enquiries may be made to Professor R Martinez-Botas at r.botas(at) imperial.ac.uk or +44(0) 20 7594 7241. Our preferred method of application is online via our website http://www3.imperial.ac.uk/employment (please select “Job Search” then enter the job title or vacancy reference number, EN201400, into “Keywords”). Please complete and upload an application form as directed. The Further Details confirm what information is required on the application form; in addition you may also send your CV. Please note you must submit an application form for our posts not just a CV, if you do not fill in an application form, your application will not be considered. Alternatively, if you are unable to apply online, please contact Ms C Soulal, Academic Administrator at: c.soulal (at) imperial.ac.uk to request an application form, quoting reference number EN201400. The Combustion Group of the Institute of Physics is happy to announce its one-day Spring Meeting, which will take place in Fitzwilliam College, Cambridge, on 10 June 2014. The talks will cover various modern applications of combustion simulation, such as flames in gas turbines, multiphase flow problems in diesel engines, fires, and MILD combustion. The speakers will also discuss the needs for further research. Students, post-docs, academics and industry representatives are invited to attend. For Paper submission and Registration visit site at www.NTNU.edu. Authors are requested to submit extended abstracts of maximum length two pages by 21st February 2014. The programme will consist of short oral presentations based on accepted extended abstracts. The meeting will take place in Cambridge, UK, at Robinson College. The college is situated centrally in Cambridge, close to the famous "Backs" of the Cambridge Colleges. It will offer both an excellent framework for the meeting with the possibility for parallel sessions as well as reasonable accommodation. Accommodation (night 27/28th) £85 including full English breakfast. It is with the great sadness that we have learnt of the sudden death on 14th January 2014 of the eminent fire scientist, Professor Philip Humphrey Thomas, aged 87. Philip graduated with First Class Honours in Mechanical Engineering from Cambridge University in 1945 obtaining in 1950 a PhD from research on Rubbing Solids in the Physical Chemistry Department. After a year as a special research trainee at the Metropolitan Vickers Company in Manchester he joined the Fire Research Station (FRS) in 1951. He was promoted rapidly to Principal Scientific Officer by the age of 30 and awarded Special Merit Senior Principal Scientific Officer status in 1962. He started his work in the section at FRS concerned with extinction of fires, later to become its head studying the ignition and growth of fire, examining the use of models, flame behaviour and roof venting. A paper published in 1963 describing the venting of smoke from pre-flashover fires was the predecessor of current two zone smoke models. In 1966 he spent a one year sabbatical at the Building Research Institute of Japan developing very close link with that country and was also, later, Visiting Professor at the University of California, Berkeley in 1980, the Science University of Tokyo, 1982, the Technical University of Denmark in 1987 and the University of Lund, Sweden from 1984 to 1990. Throughout his career at the Fire Research Station from 1951 to 1986 he published much of the key seminal research that has provided us with our scientific understanding of fire. Ranging through contributions on self-heating, thermal explosion theory, through fire extinction and buoyant diffusion flame theory to the modelling of forest and building fires, his name is dominant in author citation indexes in the field. 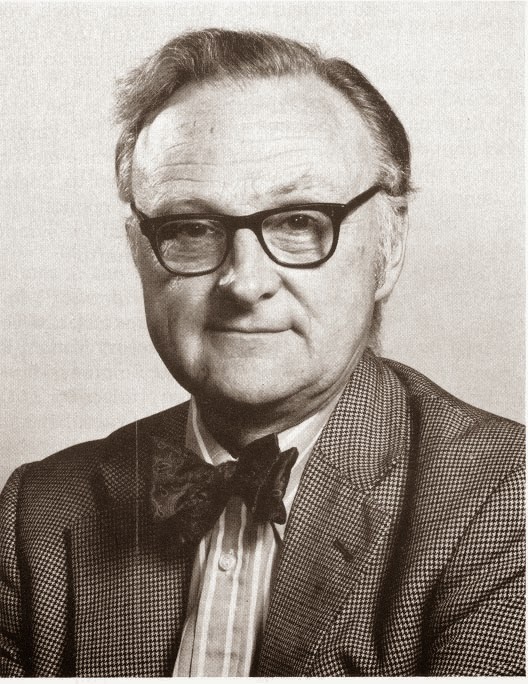 During his time as Springer Professor at Berkeley in 1980 a Symposium was held in his honour. To celebrate his retirement from FRS, the UK Building Research Station published a special collection of some of his papers. He continued to contribute well after his retirement from FRS and was still publishing scientific papers as late as 2010. In addition to his research, Philip was Co-ordinator of the Fire Commission of the Conseil International du Batiment (CIB W14) from 1974-1994 and Chairman of the International Organisation for Standardisation Fire Safety Committee ISO TC92 from 1976 to 1995. He was the founding father of the International Association for Fire Safety Science. It was he, along with like-minded researchers from across the world, who made the first moves in 1983 to establish a new international association for fire researchers. They had recognised that, whilst there were several organisations then in existence that embraced some special aspects of fire there was no single institution that covered the full diversity of topics that constituted fire safety science. Phil drove the initiative forward, establishing it at the very successful First International Symposium on Fire Safety Science hosted in the US in 1985 by NIST (then the National Bureau of Standards). At that Symposium he was elected the Association’s first Chairman and served in that capacity from 1985 to 1991. At that time the world was far more fragmented than it is now but Phil’s rigorous commitment to internationalism ensured the enduring success of the Association. He took the lead from the Combustion Institute and the Royal Society in seeking to establish charitable status for the IAFSS which was achieved in 1988. He was particularly animated about the need for high standards in fire research and it is particularly fitting that the IAFSS now names its award for best paper at its Symposia as the Philip Thomas award. Phil will be sadly missed by many friends and colleagues from across the world not only for his unique contribution to our field but for his warmth, wisdom and his analytical insight.